Mouse traps. We created a cozy nest, how inviting! Exterior LPG “Stay A While” set up and tank rental. We bought a Stay A While deluxe with TEE and 12′ Hose with 1″x20 Male x 1″x20 Female 5′ Hose with P.O.L. x 1/4″ Inverted Flare to fit a rented external LPG tank. We used about 100 lbs of LPG per month. Inside & outside magnetic vent covers to slow the draft. More blankets for the bed, the couches, and Cleo. More rugs. For the floor and the dash. Lamps. My peacock lamps are retrotacular and handy! They kept the front windshield lookin’ fresh and clear of frosty condensation. Toaster / convection oven: Okay, so this wasn’t a necessity, but vent-less (non LPG) cooking, served us well. Cozy in the snow with our external LPG Tank. Rug remnant to cover cab drafts. That’s No Clog: We took the constant use of antifreeze tip for granted, skipped a pour down, and froze our tanks— solid. Remember our story on Facebook about the clogged kitchen sink? Well, that wasn’t a clog, there were icebergs in our holding tanks. 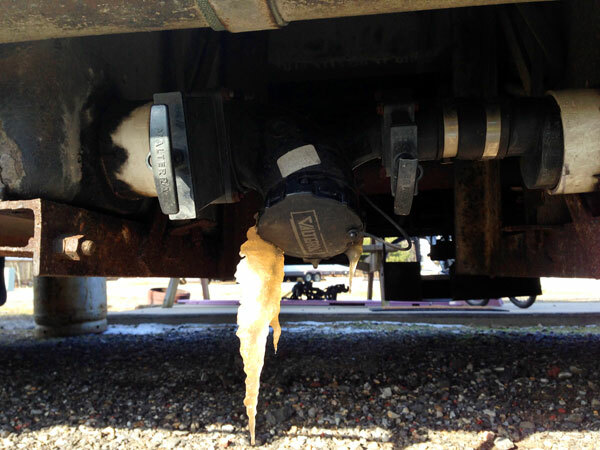 Tip: The Solution to De-icing Frozen RV Holding Tanks. Trying to de-ice the tanks using a blow dryer was ridiculous. We even tried wrapping it with heat tape, with no luck. We were dealing with two, over 35 gallon, frozen solid blocks here. This required us to get global warming on these ‘bergs. Yup, our favorite fiery star, some salt, and time was our solution. First, we relocated to a spot in the park where the sun would shine directly on our facilities side of the bus. Then we began de-icing the valve openings by pouring hot water and dissolved rock salt down the drains. We did this in the heat of the day, when it was above freezing (by one degree). Plus, we added antifreeze to the tanks at night. This process took about three days, and eventually our stars aligned, our poopcicle melted, and our drains opened up! Because it is necessary to continue to add antifreeze to the waste tanks, before, during, and after dumping, that adds up to a lot of antifreeze. 10 gallons to be exact. This discovery, at $2/per gal for wiper fluid vs $5/per gal for RV antifreeze, saved us a chunk of change. Whatwhat! Despite our best efforts in using the foam insulation to keep our fresh water hose from freezing, it froze anyway. 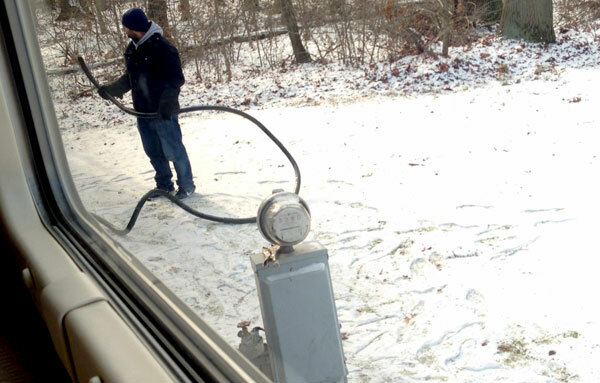 And how exactly do you get that ice out of your hose? You don’t. It has to melt out on its own. Dennis spent 12 long minutes, banging, spanking, and blowing on it, and it never even so much as dripped. Future solution: We should have bought a heated hose like this: Thermo-Hose Ice-Free . Lesson: Cold Feet Makes for Better Lovers. I don’t care what KISS says, it ain’t Hot In The Shade. The constant cold creeping under the bus could have been somewhat avoided with proper skirting, but we didn’t flip for it. Every other brave soul in the campground had added some sort of insulated paneling or skirting to their wind tunnel underbelly. Cold floors were our reality, but we saved at least fifty bucks by not buying all of that stuff. We survived by purchasing more area rugs and wearing slippers, hoodies, and beanies. So, if you’re going to stay a while, skirt-up or else suit-up. Happy Endings, The Winter-Ready Wanderlodge. Our fresh water tank is under the bed with a compartment heater. It was the only liquid holding area that didn’t freeze! The bus has seven heaters. Three propane and four electric but, two of the electric heaters don’t work though. Six heaters for 35’ was perfect. One LPG and one electric in each room. We incurred hail, snow, 60 mile an hour winds in the rain… and knock on wood, no leaks. Heavy curtains and well insulated walls kept the cold under control. Hey, what’s that switch? An Engine block heater! Frankly, we’re still not sure how the hell we survived, but we did it. 300 lbs. of propane, 10 gallons of windshield wiper fluid, and a few good bouts of sunshine helped us along. Not to mention the serious local Italian food that packed on just a few extra body-warming pounds. We hope you find this blog post before you experience your own mishap! And if you have a RV wintering lesson to share, please leave your story in our comments. This sharing stuff has helped us more times than we can count. 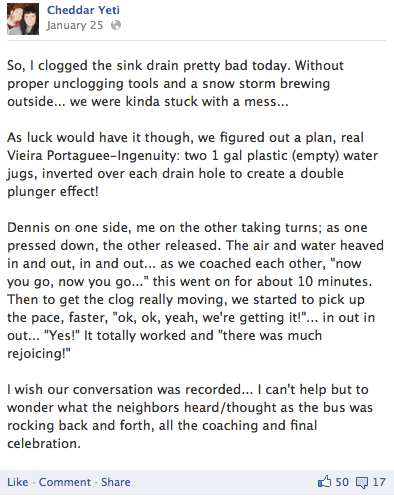 Wow, I had no idea you froze your waste tanks…..that must have been a fun 3 days! Fortunately for us the Newell comes with waterbay heaters……all our tanks (fresh, gray and black) are in one place….the bay is insulated, but even with that you need some heat when it gets below freezing. When underway there is a chassis heater that runs off the heated radiator coolant. For stationary with 50 amp hookups we have a 10 amp electric heater, and if we can’t use that there is a gas furnace vent that runs off the middle furnace. Inside we have two 10 amp electric heaters (front console, and bedroom) that do a pretty good job for the front and back, but for the middle of the coach we have a portable heater we plug in….we used it a lot in Campbellsvile at Amazon. We used the foam hose cover, and only had the hose freeze once….when that happened we just turned on the water pump, and switched to our fresh water tank, which we kept full for just such occurrences. Glad you are now headed into warmer climates! Yeah, it was an interesting 3 days…that’s for sure! We have a chassis heater when driving as well, that USED to heat water when the old water heater was in here. We used it only once when testing the rig before we bought it. We have 3 electric heaters, one in the front/mid/rear. We have 3 propane heaters, one in the front/mid/rear. There is also an electric heater in our fresh water bay under our bed. Keeps it around 50 degrees in there. Needless to say, we can keep pretty toasty in here! With the front of the coach being the exception. There are lots of cold drafts that come through the front. So we used blankets/pillows/rug/foam to plug those holes. And throw in a nice little electric space heater for the cold floor and we’re good! After our hose froze once, we did the same by using our stored water and only using the hose to fill the tank. Here in Virginia, we are having nice days and cold nights, and I love seeing those temps rise, but I am sure we will have another learning experience trying to keep this Bird cool! Hope to meet back up soon! Thanks for the great write up! You guys did real well, I really appreciate your sharing your knowledge with all of us! On the wiper antifreeze in the holding tanks – 10 Gallons lasted 3 months? Just to get an idea, how often would you have to empty your tanks? You said the heat tape failed, did you freeze your water pipes? Where are the cold spots? Between the kitchen and the bathroom? I’m really enjoying living vicariously through you as you journey West. I still have a month + before I can take my Wanderlodge out of hibernation! Thanks for following along! We are always researching stuff and appreciate any info out there, so it feels good to share what we know and learn. Nothing like good ole sunshine to the rescue! Keep in touch and maybe we’ll see you out there! Such good info, thanks. My family is in the NE so I know I will have SOME winter camping in my future life. Not a whole winter though if I can help it, ha ha. I was cold in my HOUSE (NH) when you were posting your winter pics during that never ending cold snap!! Yikes. Good for you hardy souls. One thing I will try under my floor rugs will be those interlocking foam squares. I use them in on the concrete in my basement laundry room and in winter I can walk barefoot comfortably. They are cheap and you could custom cut them with a utility knife. I think they’d be a great floor warmer. The ceramic heater under the bed was a good idea. Glad to see you heading to warmer climes 🙂 See ya! Yes, you will! But you’ll survive like we did with some fun stories to tell. Your idea about the foam squares is great, that’s a good tip to have in our back pockets in the future. Can you get those in different colors? My peacock lamps would look awesome with some yellow and dark grey flooring I bet. Cheers! Thanks for staying in touch. Even with the tanks nicely protected, the dump valves still had a tendency to freeze up. A generous scoop of rock salt put into the tanks immediately after dumping would run down near the valves and helped to keep them from freezing. I never had a situation where they were totally blocked by ice. In my ‘bird, I used an oil-filled electric heater for quiet heating. It kept the bedroom quite toasty, though it took up a lot of the limited floor space. In my subsequent RV (a small van-based Roadtrek), I use a very small electric “ceramic” heater to supplement the onboard heating (though the Roadtrek is completely unsuitable for camping in freezing conditions). Best of luck to you — and I look forward to seeing further messages as you progress on your trip. If you have time, swing through southern Utah and take in Bryce and Zion NPs and go through the Escalante area. If you stick to your current route (across on I-70), you can see the region in the distance from several viewing spots, but the incredible geology is worth the side trip. Pete, great tips! We’re learning all sorts of amazing details about our new bus! Wintering in it was a huge learning curve, but it was cozy outside of our own silly mishaps! It’s crazy you bring up Roadtrek class B, we really wanted one of those both times we were in the market for an RV. We still love the idea of going super small, but realize some of the lack of flexibility as well. Good point in the lack of Winter resources in one. Oh and we do love the Utah, Zion, Moab areas, we’ve been through there a couple of times. Mouth watering views! And yes, re-routing is well worth it. We’re thinking of hitting Salt Lake on this trip but plans are always changing…. We like to keep our options open, right to the last second. Ha! Cheers and let us know where you are on the road. Would love to keep up with you too! That’s crazy! I’ve read bits and pieces but that was a great coverage of the wonder of wintering over. We’ve stayed over in below freezing temps but not +1 for a high so I don’t know how our rig would handle it. We’ve been toying with buying or making a skirt the whole time we’ve been out – sounds like we should get one if we’re going to be wintering! Woah, Keith… I meant 1 degree over 32, as the days high temp. Although the lowest temps we encountered were are around 12, it was cold enough for our bones! As for the skirting, we would go for it IF we had the room to store it easily. When hanging out for a month say, it would be worth putting on in both summer and winter to conserve resources. Just like windshield cover, it really does work wonders. Of course, some would say just too stay out of inclement weather all together. We’re not that method though! 😉 happy travels!!! Brrrrr…I’m freezing just thinking about this and seeing your pics. You are hardier RVers than us! Previous Previous post: USA Coast to Coast, New Directions Unfurl.